At Nail Lounge & Spa we are more than just a conventional nail salon. We are the place where you can come and escape from your everyday stress and busy lifestyle. Come and relax in our ultra modern environment and be pampered with genuine care. We pride ourselves in providing our customer with fabulously indulgent nail care while maintaining the highest level of cleanliness and sterilization by using disposable tools and pedicure liners. We sterilize every metal tools and implements in our hospital grade autoclave. Our manicurist are here to ensure that you always have a positive and high quality experience. We are always up to date with the latest trends and techniques. We also offer free Wi-Fi and complimentary drinks. Gel is a special mixture that is applied either on top of an artificial nail extension, or directly onto the natural nail bed to strengthen the nail and promote natural growth. The gel is usually applied in very fine layers, with the nail technician ‘curing’ or ‘sealing’ the gel with a UV-LED light between each layer so that the finished result is hard but still flexible with a natural looking glossy finish which is both instantly dry and chip resistant. Whilst gel can be applied on top of an artificial extension to add length, they are particularly good for individuals who have very short, weak or bitten nails because they allow the nail to strengthen and grow below the layer of gel. * Gel nails may look more natural and glossy than Acrylics. * Gel does not cause damage to the natural nail and can be used to strengthen, protect and promote growth in the natural nail. 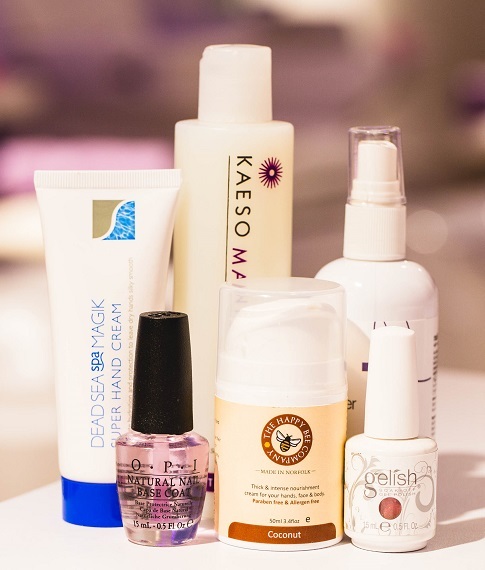 * Gel nail mixtures lack the fumes associated with Acrylic nails - they're considered a safer, more eco-friendly option.